Fruits & Passion Canada Boxing Day Sale is live now! Up to 70% Off on selected products. Limited quantities. While quantities last. 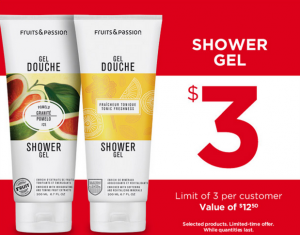 Shower Gel is on sale for only $3 each, 200ml format (value of $12.50). Limit of 3 per customer. Fragrances may vary by store. This Fruits & Passion Canada Boxing Day/Week sale is valid from now, Wednesday, December 24, 2014 online and from Friday, December 26, 2014 in-store until Sunday, January 11, 2015 or while quantities last.